Sometimes things just have to be done. 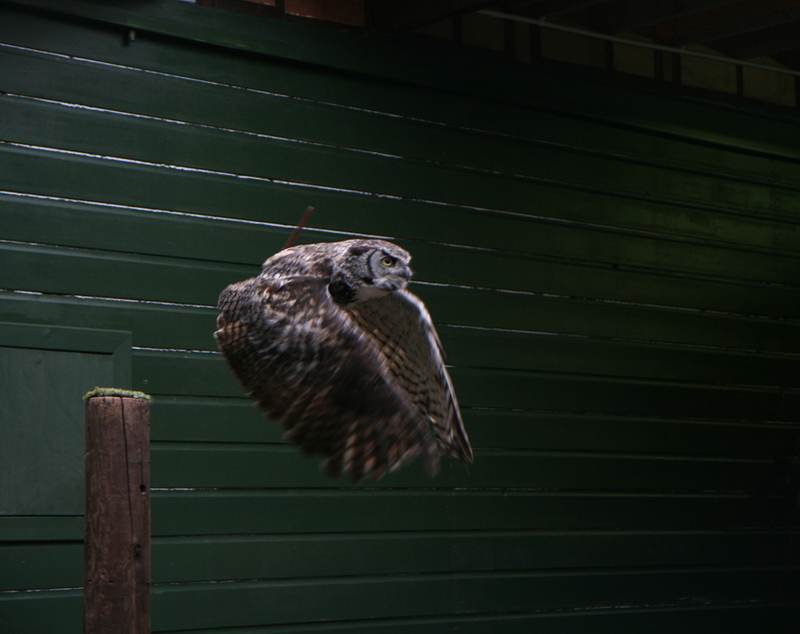 Last year, the Scottish Owl Centre relocated to Polkemmet in West Lothian, a short drive away from Edinburgh. 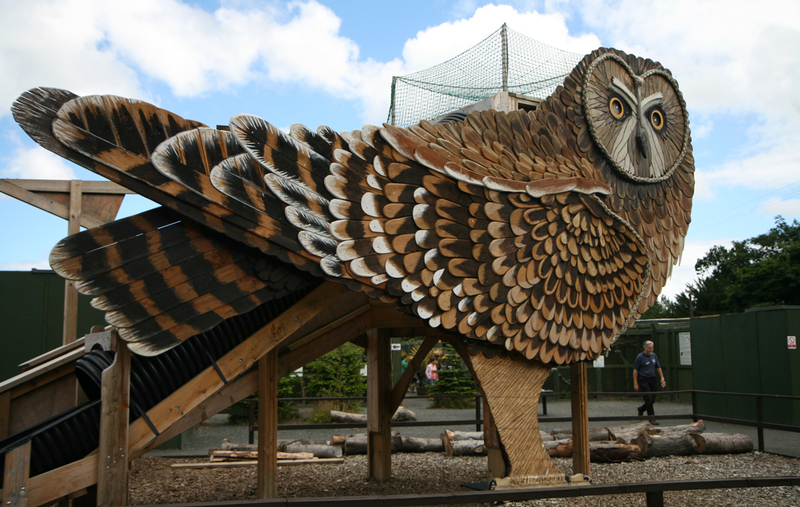 Boasting “one of the largest collections of owls in the world”, how could we not pay a visit? We met Hudson, the great horned owl. and this lovely wee feller, a Southern Boobook owl . . .
. . . whose name was . . . 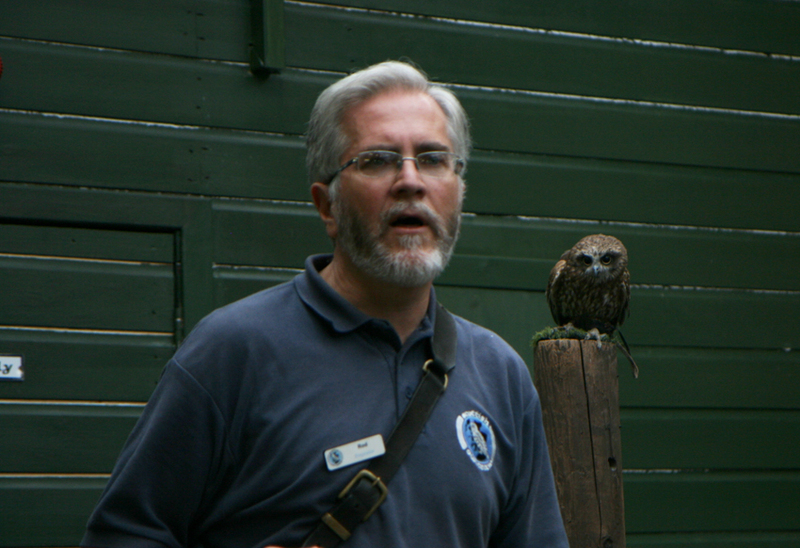 Though I have some issues with creatures in cages, I also appreciate the work of conservation breeding and education that is conducted by organisations like the Scottish Owl Centre. Rod Angus, who lead the o w l demonstration, was really knowledgeable and I felt that amidst the ooohing and aahing we came away having learnt quite a bit about o w l s, their unique behaviours, and the ingenious ways in which they they adapt to their environment. 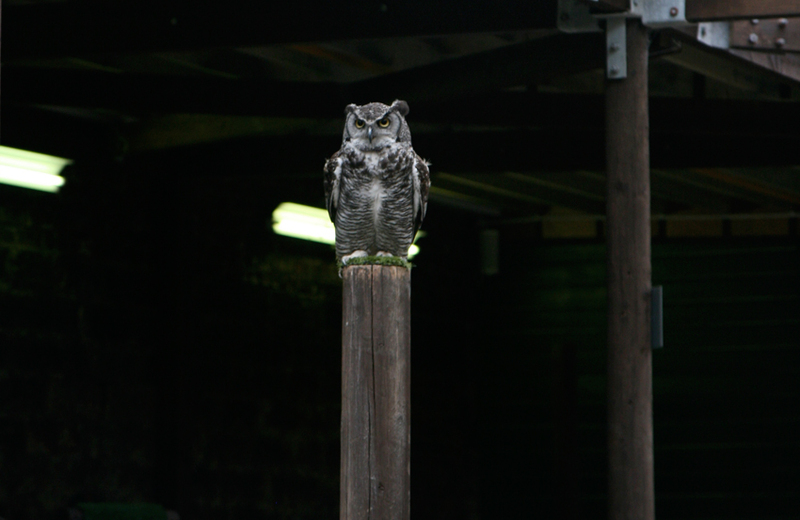 We saw lots of other beautiful o w l s but I think that this chap – a milky eagle owl – was our confirmed favourite. 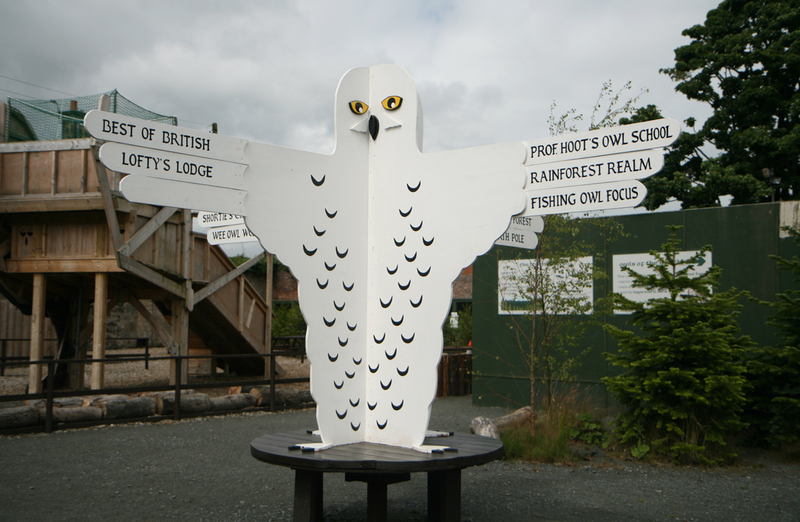 You can find the Scottish Owl Centre at Polkemmet Country Park in West Lothian, between Whitburn and Harthill (leave M8 at Junction 4). @ScotOwl on twitter. Did you wear your “Owls” sweater to the sanctuary? How absolutely lovely…delightful creatures…very efficient carnivores. Now I must try to find an owl centre in Texas. We do have a bat sanctuary about an hour away and it is fascinating. Bats are actually charming little things. Love the idea of Bruce the Southern Boobook in Scotland. How on earth did he get there? Was he researching a book? We have a pair raise their family in our garden each summer, and they are soooo Bruce-ish. Love Tom’s face in the first picture. Thank you for sharing something so beautiful and close to my heart. I volunteer at a wildlife hospital and rehabilitation center that also focuses on education for the public. The only animals who are considered to become ambassadors to the public for educational purposes are ones who cannot be released due to permanent handicaps and who are also at ease living around people who take care of them daily. Seeing a live animal up close is a wonderful way for people to develop responsible habits regarding our wildlife. Owls have always been a favorite of mine and your European ones are delightful! I’m lucky enough to often hear the calls of Southern Boobook owls as I drift off to sleep. The children’s stories of wise old owls make the sound very reassuring somehow. Loved seeing the owls. I have also been to the same eagle center in Wabasha, Minnesota that Rachel mentions, as well as a wolf sanctuary in Ely, Minnesota. As others have said, I hate seeing them in cages, but sometimes it’s necessary in order to save some. Thanks for the look at the owls. 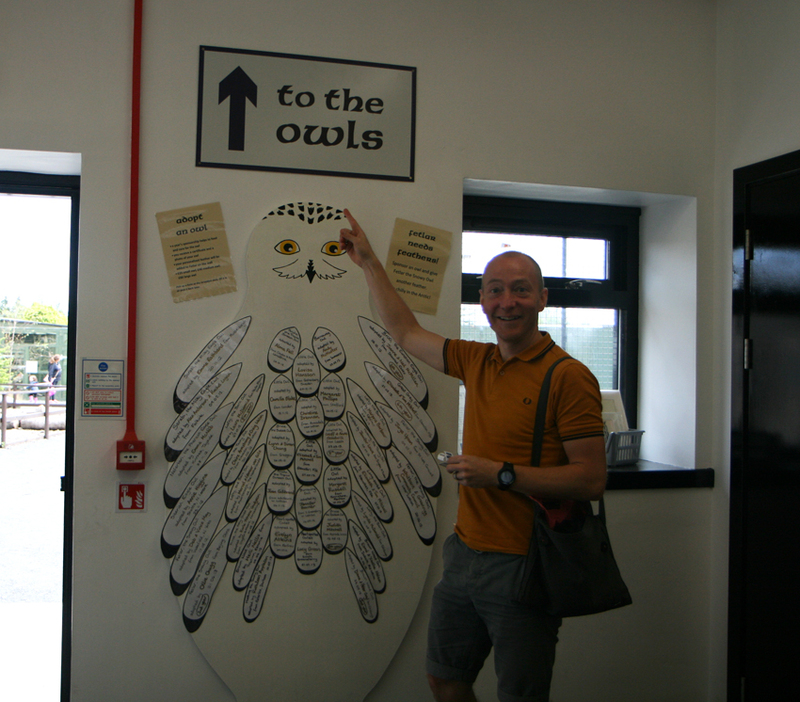 Love that one of the owls was named Bruce! that was great! will send this on to me sister as they are her most favourite birds, thanks. I’ve visited the Suffolk Owl Sanctury a couple of times-I even won a half day falconry course…which essentially consisted of donning giant protective gloves and having owls and other birds of prey sit on my arm. It was amazing. The highlight was probably meeting a spectacled owl chick, which was essentially a giant bundle of fluff. I too am not really a fan of animals in cages- the birds seem ok, comparatively, but seeing big cats in tiny enclosures always makes me sad. I’ll echo the call for using that lovely Milky Eagle Owl for knitting inspiration! Wow–What Beauties. The eyes on the Milky owl are amazing. 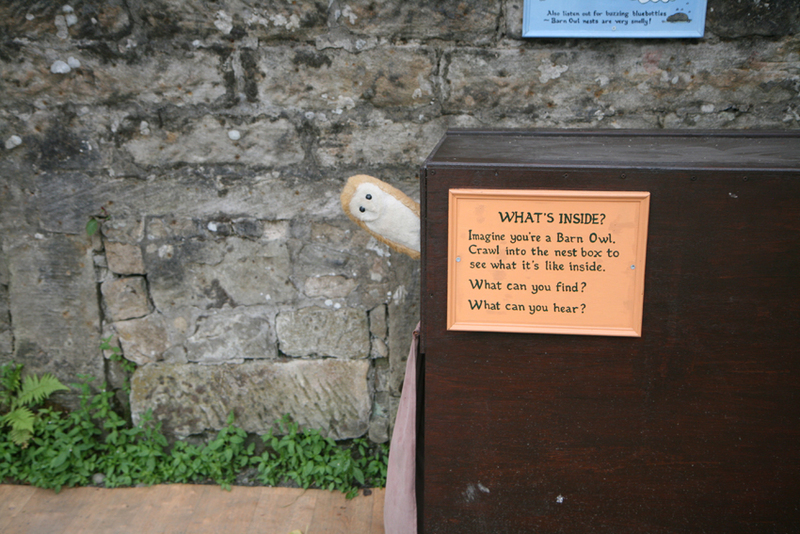 When we lived in Michigan, USA, we had a little white owl (barn?) fly in through an open door. He had been checking out remains on the grill from b-b-q chicken. We threw a towel over him, petted his sweet head and escorted him back into the night. We do have Bird Rescue places here in Illinois for injured large birds. Amazing volunteers care for them and rehab them as best they can. Some even make it back into the wild. 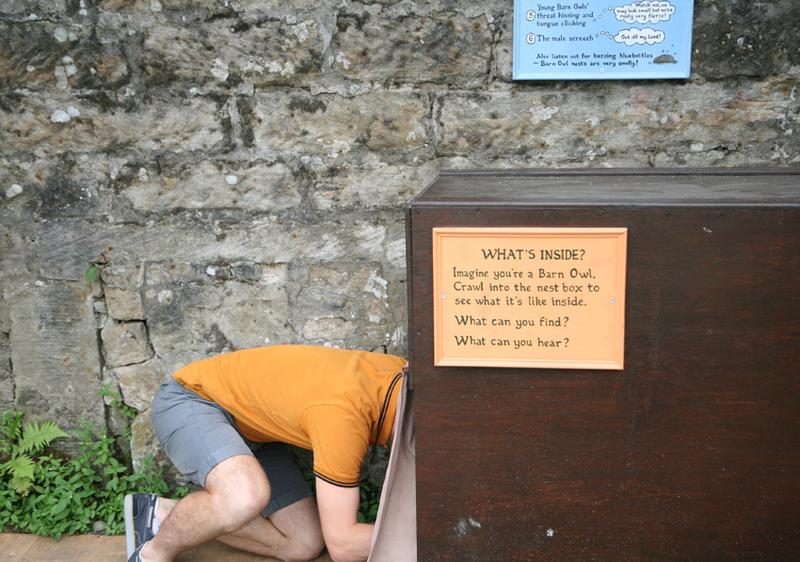 We must try to include a visit next time we go up to see Stuart and Alison – it’s not that far away from them. Wow! What beauties! How about a pattern using the Milky Eagle Owls feathering as inspiration? Natural Shetand fleece colors maybe? 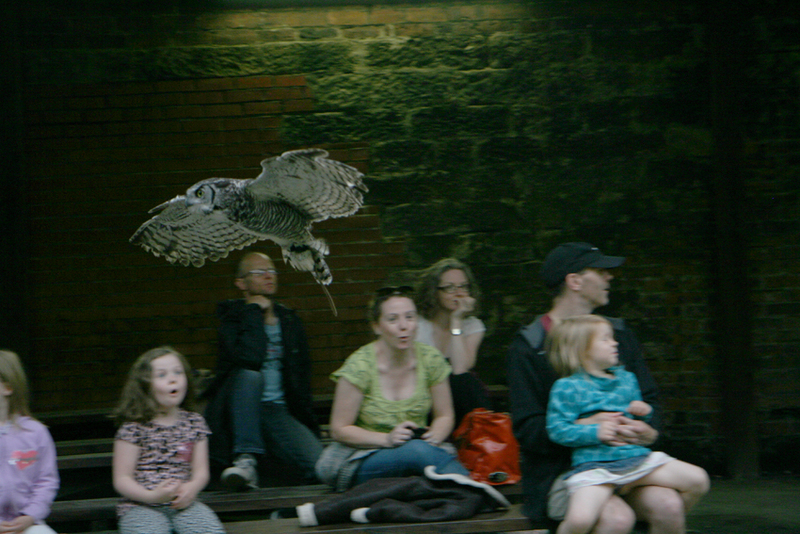 What a collection of expressions: cross Hudson, inquisitive Bruce, sleepy milky eagle owl, and a gleeful Tom. This is really lovely, Kate, and we live not too far away, and didn’t know about it, and now we’ll visit! 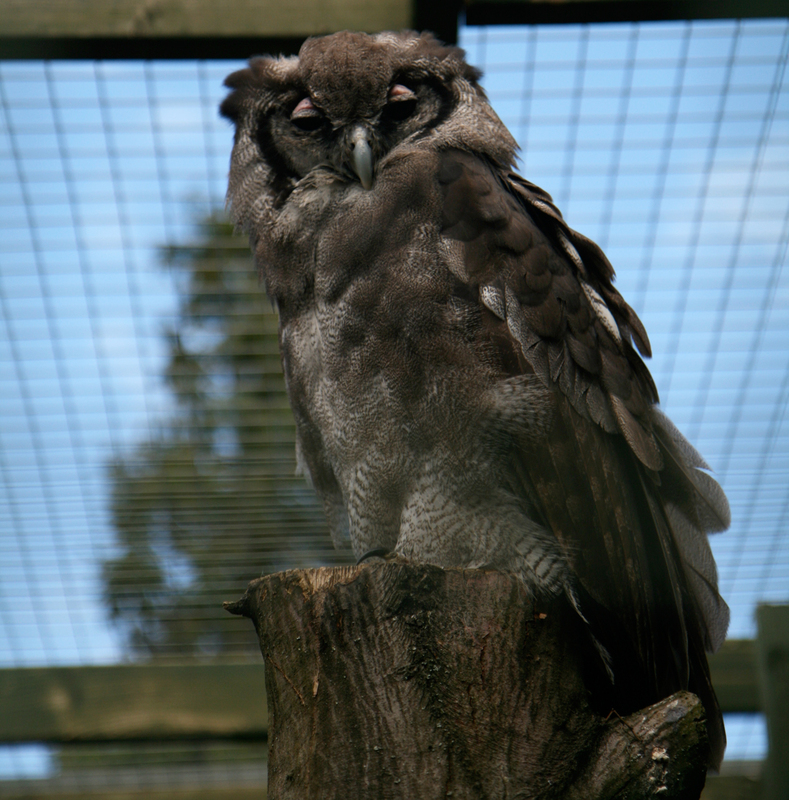 When looking at your photo of the Milky Eagle Owl, I just felt a patter may be coming from you, especially with the lovely, wavy lines of his feathers …. My parents took me to a similar place for eagles in Minnesota, USA: http://www.nationaleaglecenter.org/ The eagles in captivity had all been rescued and were damaged. They would not have survived in the wild. They looked fierce and royally disdainful. There was a huge glass window overlooking the Mississippi River where they could see other eagles flying free. It’s sad, but we are killing so much of the wildlife around the world, that some species will only survive in captivity. These educational centers do a lot in changing our sensibility towards Nature as a whole and I admire them. Thank you so much for sharing! Owls are my favorite big birds and we do have some in the neighborhood plus a rescue center just south of us.